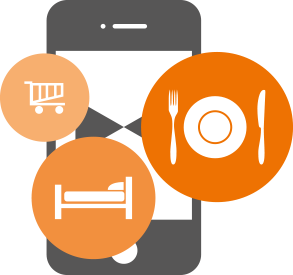 A hospitality software and technology company enables a cross platform mobile solution with a focus on experience management and ideations. Capitalizing on dramatic shift in consumer mobility use. Our client is a hospitality software and technology company that specializes in developing apps for hotels and restaurants. Our client needed a product that could provide customized solution to these hotels and restaurants to facilitate cross selling and upselling services. Our client needed a mobile solution partner to provide a cross platform customizable and configurable solution. The increasing mobility of consumers had led to be a major challenge for the client. More than 41% customers were using mobile apps to find restaurants and hotels while travelling. Also, more than 65% of all online hotel reservations were being made on the same day as check-ins. To meet this challenge, our client needed a cross platform mobile solution that could mobilize them. With the increased focus on ancillary sales, revenue per available room (RevPAR) and personalization for partnerships and revenue management, the solution had to focus on experience management and ideations. Their current implementation cycles were long and error prone and had performance issues due to poor architecture and non-responsive design. The solution had to focus on experience management and ideations. To meet this challenge, our client needed a cross platform mobile solution that could mobilize them. Infostretch created a cross-platform mobile solution which increased sales by 10x. Even a short phone call can help us explain how our solutions can accelerate your mobility, jump start your continuous delivery and help reduce costs. And that’s just for starters, understanding more about your project will enable us to build a solution that fits your objectives, infrastructure and aspirations!